Straight from the OCG’s news site. (1) When this card destroys an opponent’s monster by battle and sends it to the Graveyard: You can Tribute 1 monster this card points to; Special Summon that destroyed monster to either player’s zone this card points to, and if you Summon that monster to your opponent’s zone, this card can make a second attack during this Battle Phase. You can only use the effect with this card’s name once per turn. 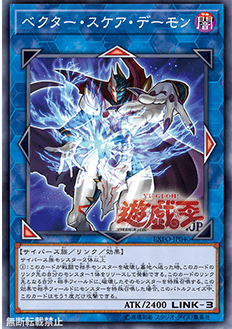 (1) (Quick Effect): You can target 1 Cyberse Link Monster in your Graveyard that was destroyed this turn; Special Summon it, but it has its effects negated (if any), also it is destroyed during the End Phase. (1) You can only control 1 [face-up] “Security Gardna”. (2) After this card was Special Summoned, you take no effect damage for the rest of this turn. (3) The first time you would take battle or effect damage each turn, you take no damage. TL note: OCG text doesn’t usually specify [face-up] in that spot; perhaps this is a Series 10 standardization change. We shall see.